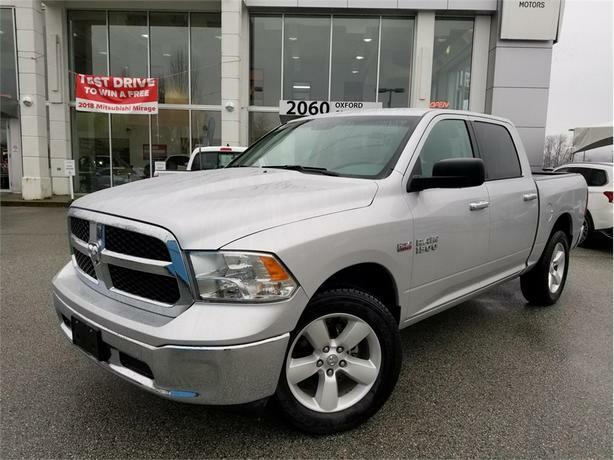 This Ram 1500 has no accidents, fully inspected 6 passenger and well equipped SLT model. 5.7 foot box Crew cab powered by a 5.7L Hemi V8. Remote keyless entry, alloy wheels, A/C, all the power options and much more with only 25,000 kms. FREE CarProof report and Safety inspection available for review. Large used car inventory! Open 7 days a week! Lifetime oil change package available. Low interest rates on approved credit - we specialize in tailored financing. No credit, Bad credit financing with close to 100% approval rate. Cash back options. Call us today to find out how at 604 464 3330 We accept all local and out of town trade-ins. For additional vehicle information or to schedule your appointment, call us or send in inquiry. Come and visit us: 2060 Oxford Connector - behind Safeway and across of Esso gas station.